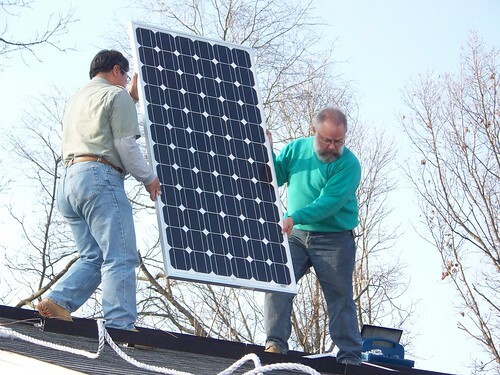 The local power company, Consumers Energy, decided to try an experimental "Feed in Tariff". They are calling it "EARP" for Experimental Advanced Renewable Program. 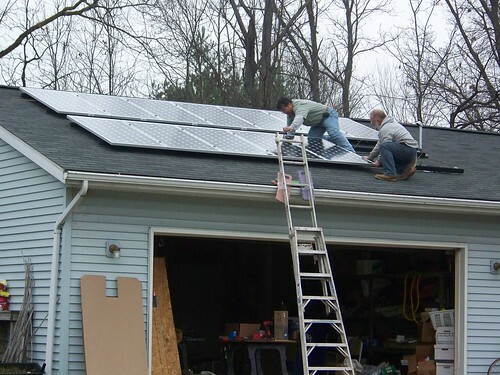 This should pay a high rate for a limited amount of solar energy to the power company by home owners. I signed up for the program and was accepted. 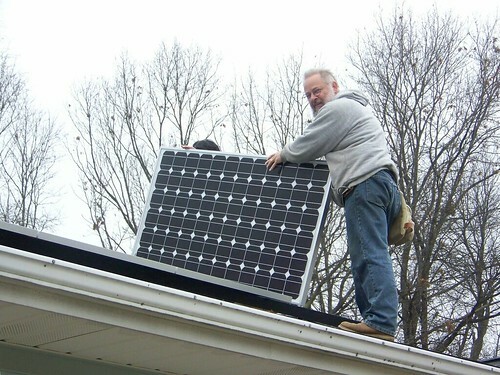 I contracted with my brother Dan's company, Four Elements Energy, to put in the solar power system. The installation took about 2 days. 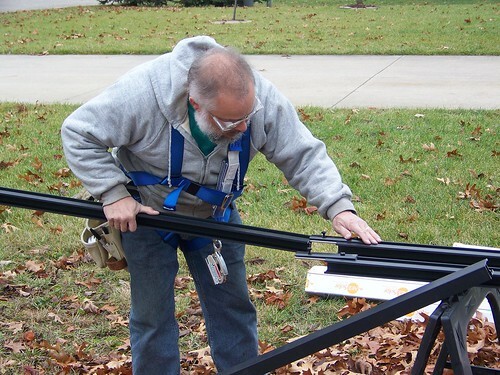 Lloyd LeZotte (Four Elements Energy) is splicing together the rack that will hold the solar panels. 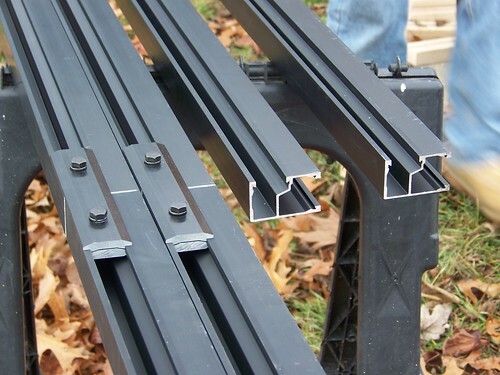 End view of the aluminum etrusions for the racks. The open side of the extrusion on the right will face up to hold the wiring. 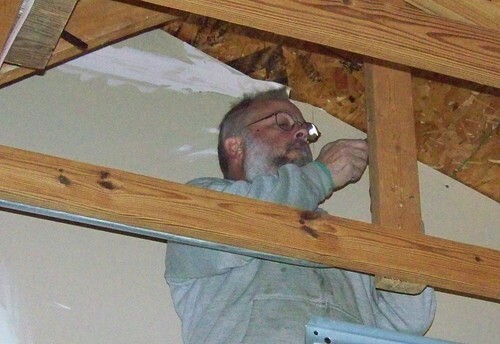 Caulking the roof attachment points. No leaks in my garage please! Bolting in the rack holders. Art Toy (Four Elements Energy) bolting the racks to the roof. 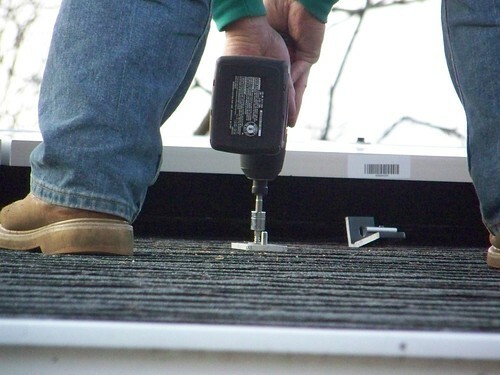 All bolts are torqued to 10 pounds. 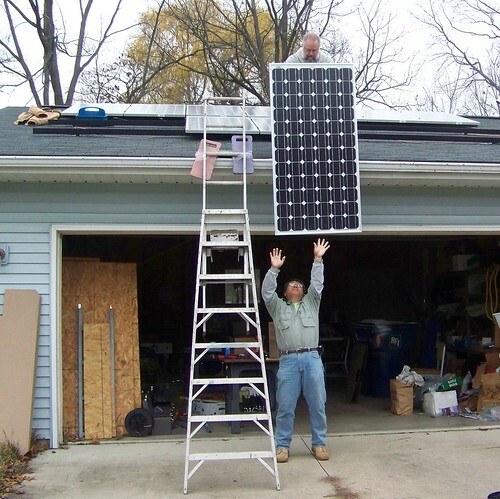 Up goes a solar panel. Each panel weighs about 35 pounds. Each solar panel has 72 cells in series. The cells are 5" (125mm) square. They were cut from 6" (150 mm) diameter single crystals. Each panel has a nameplate of 175 watts, totalling 2.45 kW for all 14 panels. The last panel being placed on the rack. 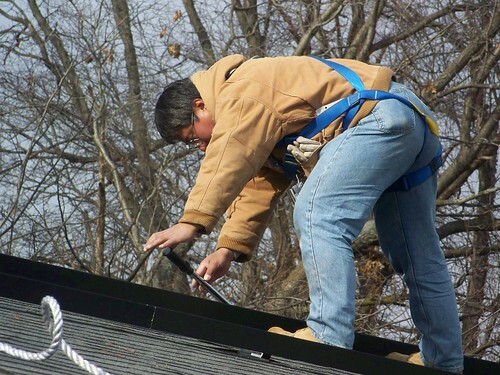 Connecting the wires on the back of the panel. 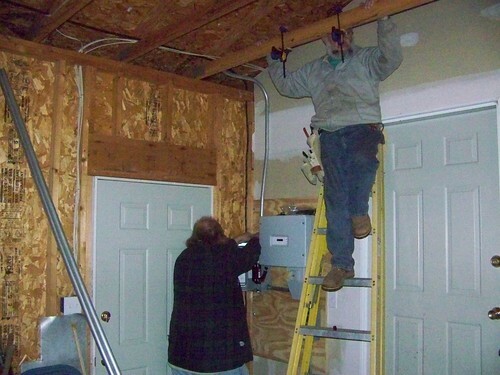 Both power and ground wire must be hooked up. Two rows of seven panels nearly complete. Each panel is about 32 x 64 inches. DC wire conduit comes from the solar panels through the ceiling into the garage. 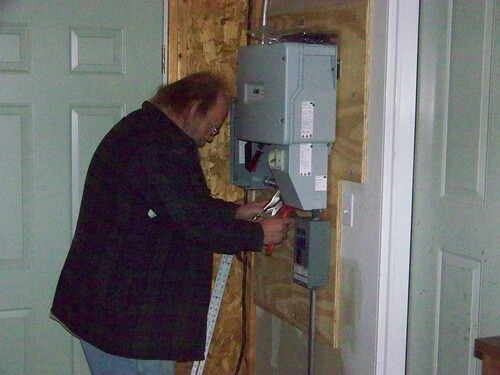 The DC wire conduit goes across the garage to the inverter box. 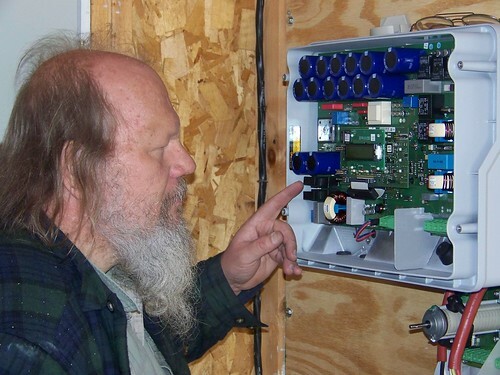 Dan Alway (Four Elements Energy) checks the insides of the inverter. The Inverter converts the DC power from the solar panels to AC current compatible with grid electricity. The inverter wiring nears completion. Below the inverter is the AC shut off, to the left is the DC shut off. 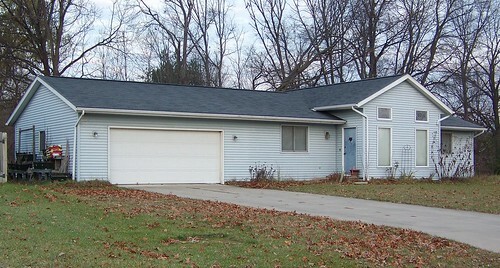 My house before solar panels. 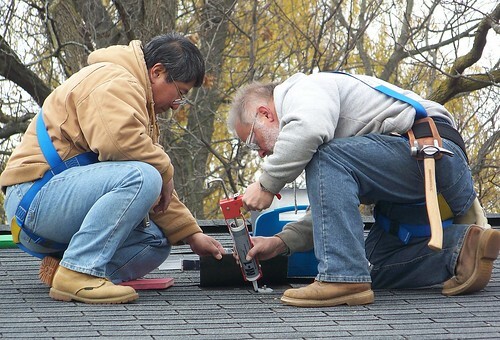 The whole process costs about $18,000+ for a 2.45 kW installation that will produce about 1,900 kWH per year. I expect to recover the cost from a 30% tax credit and the $.65 per kilowatt hour feed in tariff over 12 years. Wow, very cool. Go you! 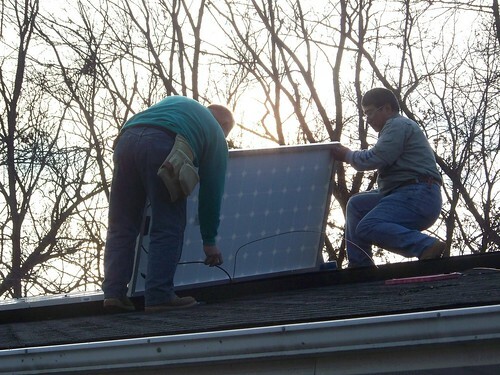 Do you have an overall house *with* panels shot for comparison? Or are you waiting for a sunny day to show it in operation? I have an after shot in my camera. I just haven't gotten around to downloading it yet.